A Halloween Treat: Read "Mr. Eastman's Empathy," a Complementary Download of an Eerie, Could-it-be-Possible Short Story from Daniel Grotta's Book "Seven From Haven"
Set in a small Pennsylvania mountain village, where strange and wondrous things happen, "Seven from Haven" are quirky, fantastical short stories which prove what they say about this town: “Haven takes care of its own.” Here's a Halloween gift from the publisher Pixel Hall Press, a short story from "Seven From Haven" which may be reposted, with attribution. “You know that feeling you get after watching ‘It’s a Wonderful Life’? When I finished reading [Seven From Haven] I had to wipe a tear away, and sighed, ‘That was wonderful.’” ~ Wendy Delmater, "Abyss & Apex Magazine." Or, buy "Seven From Haven" in paperback or as an eBook from Amazon, Apple, Barnes & Noble or other bookstores, including an independent bookstore near you. 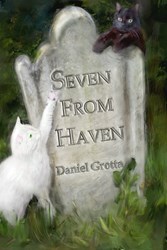 Members of the Press: Please contact cynthia(at)pixelhallpress(dot)com to receive a review copy of "Seven From Haven." Daniel Grotta has worn just about every hat in publishing, including investigative journalist, war correspondent, syndicated columnist, editor and so forth. His thousands of articles, reviews and columns have appeared in major magazines, newspapers and online journals. He has also authored several books, including "J.R.R. Tolkien: Architect of Middle Earth," the renowned first biography of the creator of "The Lord of the Rings." Among his many accolades and awards is one that stands apart from the rest: His writings were, at one point, the most requested to be recorded as audio files by Reading for the Blind in Philadelphia, because of the visual clarity and beauty of his prose. A member of the National Book Critics Circle, the Overseas Press Club, Science Fiction Writers of America, the Authors Guild and the American Society of Journalists & Authors, Daniel Grotta is a frequent speaker at conferences and other events on writing and publishing. He also welcomes invitations to participate in discussions with book clubs and classes (occasionally in person, more often via Skype, Google Hangout or phone), and to do occasional readings. Authors interested in sending queries to Pixel Hall Press, should read the Writers Guidelines first.